WHAT TO EXPECT: ZP-500 Fuel Lubricant Additive will provide better early morning starts. Excess emissions or a smoky exhaust will subside. Acceleration and performance will improve as ZP-500 Fuel Lubricant Additive goes to work on dirty plugs and carbon that may have come from incomplete combustion. ZP-500 Fuel Lubricant Additive cannot repair your car if it is broken, but continued use of ZP-500 Fuel Lubricant Additive will reduce and prevent mechanical failures and decrease maintenance trips to a repair center. For some, this has resulted in financial savings often equal to a whole year’s supply of fuel. HOW IT WORKS: ZP-500 Fuel Lubricant Additive will provide better response and performance from your engine because it has removed combustion chamber deposits and it contains an undersurface lubricant which impregnates metal surfaces, lubricating dry cylinders. ZP-500 Fuel Lubricant Additive dissolves hard carbon formations such as lacquer, gum, varnish and wax which are derived from the partially burned hydrocarbons in the fuel. This promotes the release of rings and valves, increasing the engine’s RPMs and brake horsepower. ZP-500 Fuel Lubricant Additive performs a cleaning action for fuel injectors to remove foreign matter that can ruin the spray pattern and proper combustion. Considering the varying quality of gasoline at service pumps, ZP-500 Fuel Lubricant Additive is particularly beneficial since it reduces the need for a higher octane fuel up to 10 points. APPLICATIONS: automobiles, pickups, trucks, two cycle engines, outboard motors, dune buggies, chain saws, edgers, blowers and other small equipment, planes, air-cooled engines. DIRECTIONS: Basic Ratio - 1:1500. 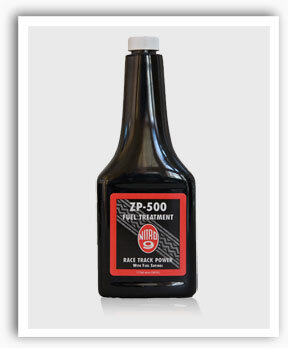 For Auto/Pickup – 12 ounces (360ml) of ZP-500 Fuel Lubricant Additive every 1500 miles. Heavier equipment requires a modified regimen of treatment. Heavy equipment should first receive a clean-up procedure of 1 gallon ZP-500 to 500 gallons fuel. Thereafter, 1 gallon ZP-500 Fuel Lubricant Additive to 1500 gallons fuel. Two cycle engines use 1 ounce per 5 gallons of fuel. Nitro 9 ZP 500 Fuel Treatment is the best friend your engine will ever have. It treats gasoline1:2000 or one ounce (30ml) treats 16 gallons of fuel. All consumers will not make the effort to transfer one ounce (30ml) of treatment at a time from the bottle to the fuel tank for maximum economy because it takes extra time; instead pour the entire contents of the 12 ounce bottle in the fuel tank approximately every 1200 to 1600 miles. Savings may be less but carbon, gum and varnish have disappeared from injectors, rings and valves and operator could still save up to 20 cents a gallon on purchase of their fuel but most people use ZP 500 Fuel Treatment to keep their car out of the repair shop. TECHNICAL: Liquid - Amber Color - Combustible - 190° Flash Point - Reactivity Stable - Harmful if Ingested.